We're so excited for Valentine's Day! To help kick off the love fest, we're teaming up with Conservamom to offer a super sweet giveaway! Every year, Feb. 14 marks the search – or sometimes scramble – for the perfect Valentine’s Day gift. Whether you plan in advance or do a last-minute dash, stepping outside the traditional gift of flowers with something a little more personalized, loveable – and tasty – can go a long way toward showing your love and affection. 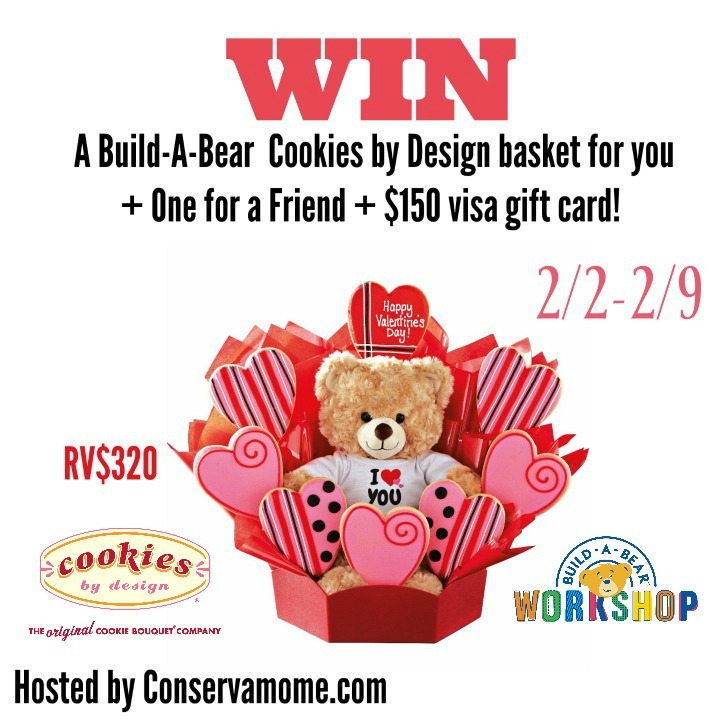 If you’re still on your search, Cookies by Design and Build-A-Bear Workshop can help with an easy and delicious gift idea. Hand-decorated cookie bouquets combined with huggable, adorably outfitted bears are the best of both worlds and make great presents for everyone from your longtime sweetheart or new flame to your favorite kid or kid-at-heart. Each cookie bouquet is made-to-order and every cookie is decorated by hand – you can even have your custom love note or photo printed right on the cookies! Last-minute gift givers can take advantage of ready-made Build-A-Bear Cookie Baskets, available at all Cookies by Design store locations with nationwide delivery, and specially customized baskets only take an additional day or two to create. 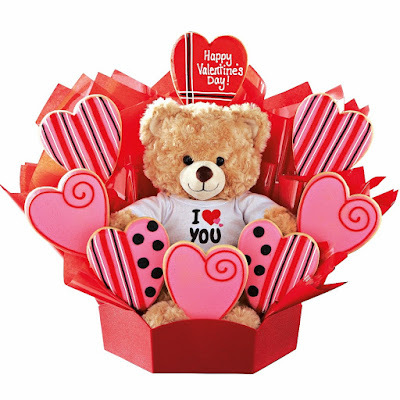 You can stop in at any Cookies by Design location or order online at: http://www.cookiesbydesign.com/build-a-bear-bouquets Valentine’s Day isn’t the only time you can order these special bouquets, though. 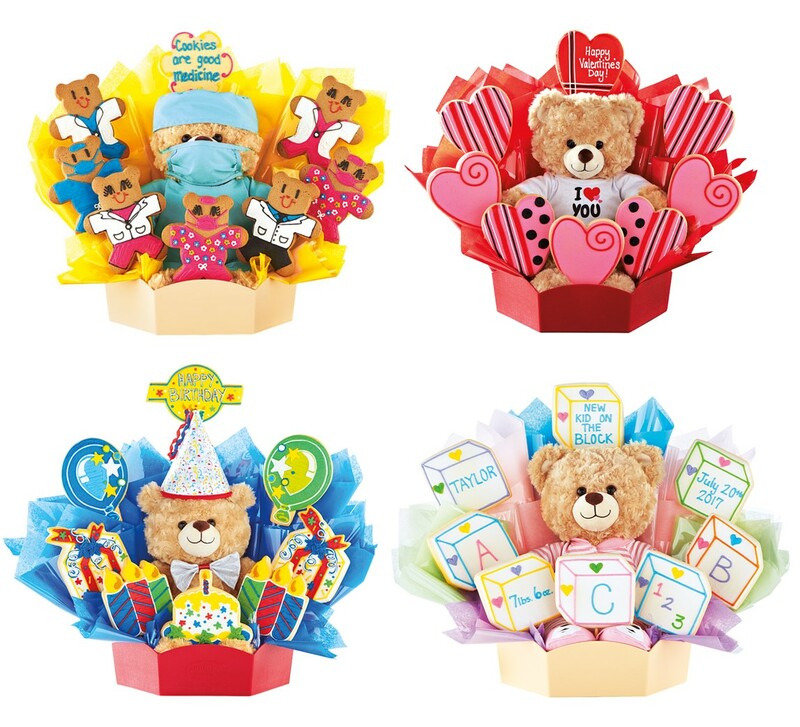 Cookies by Design also makes them year-round for birthday, baby and get well gifts.